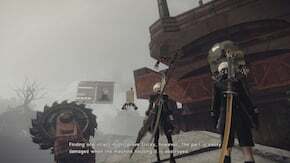 Machine Examination 1 is a Side Quest in NieR: Automata. "A wrecked Goliath is resting in the city Ruins. Gather the materials required to repair its damaged circuits." "With its circuitry restored, the Goliath became capable of limited speech. The data retrieved, however, was fragmented and of little use. Further repairs are necessary if more detailed information is to be obtained. After the attack of Goliath machines in the City Ruins, approach the inactive broken Goliath by where the Speed Star quest begins (In between Factory and Resistance Camp). The location to inspect the Goliath can be found in the middle of the road in front of the Goliath, on a small piece of rubble resembling the top corner of a building. Stand on the rubble and face the Goliath to talk to it. 9S will comment that he can repair the machine with the right materials, in order to learn more about them. If you cannot seem to interact, nearby enemies may need to be disposed of first. In order to obtain the materials, head out to the Desert Zone, and fight the enemies near the Camp area. Once you have all the materials, return to City Ruins and interact with the Goliath again. You obtain some isolated words from the machine and 9S translates its memories for you. I posted this before but I am replaying it so I will post this again for people that need assistance: If you are using Chapter Select go to Ch. 07-02. This is when you already receive the Resupply quest from Anemone. Doing this quest any earlier just results in you only completing the first half and getting Record 0010 and not the second part. If you try to jump to a later chapter after already completing the first part you will have to restart the first part of the quest along with the second half in order to get Record 0020. Just transport to a different location and come back to advance the quest further each time. The quest is on a little rock mound right next to the broken down Goliath, you have to really look at him to be able to trigger the quest to talk to him. "The location to inspect the Goliath can be a bit tricky, you need to stand on the broken building in front of it." This is not specific enough and possibly inaccurate. There is no building directly in front of it but there is one behind it. (Remember: faces are on the front of a person, not the back.) But where on that building should you stand? On the lower roof? The higher one? On top of the little shack on top of the higher roof? Where on the roof? More towards the left, center or right? If I missed this in my A ending, is it gone?